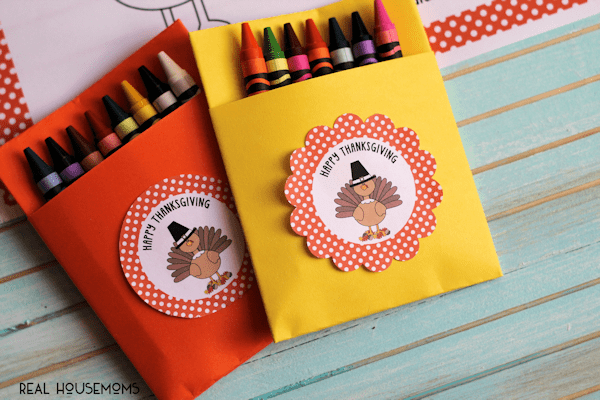 Keep the adorable children in your life occupied during Thanksgiving dinner with these PRINTABLE THANKSGIVING PLACEMATS! No matter how old you get, coloring never goes out of style does it? 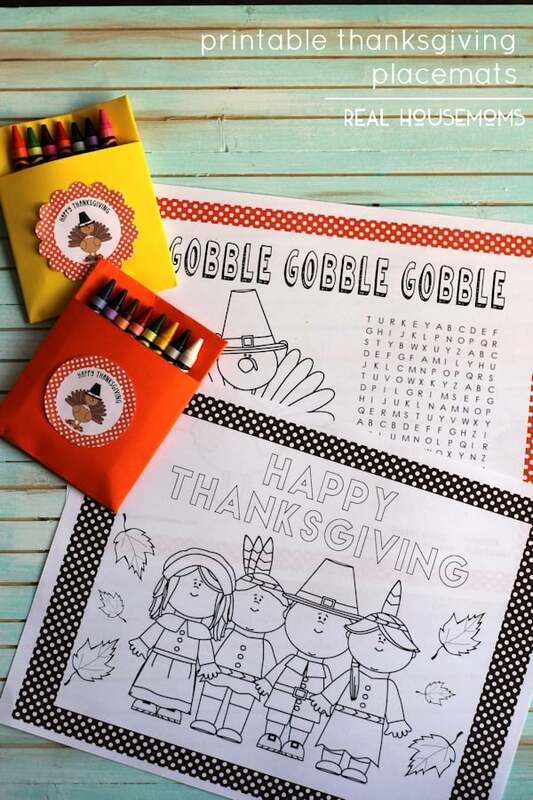 I thought it would be fun to create a couple of printable Thanksgiving place mats for my kids to use during Thanksgiving dinner. They love getting placemats with their own little packet of crayons whenever we go out to eat so why not bring some of that special feeling to Turkey Day. This set of printable placemats includes 2 different designs. I created one with a turkey and a simple word search. My girls always love those so I knew that I had to include one on these printables. The second printable Thanksgiving placemat is a simple design with pilgrims and Indians and some falling leaves. Of course the back is blank so as long as there are crayons on hand, your children’s imaginations can run wild. I also created coordinating Happy Thanksgiving tags. I cut them out with my favorite paper punches and attached them with double sided adhesive to a simple crayon sleeve that whipped up. To create one yourself take a sheet of paper (letter size is fine) and basically fold it like you would a letter. Instead of letting one edge of the paper meet the folded edge leave about an inch or so of room. (You can see what I mean by where the crayons are placed in the photo above.) Next you need to fold the 2 sides back and tuck them into each other and you have simple crayon sleeve. Of course you will want to finish it off with the “Happy Thanksgiving” tags. Print tags out onto full sheet labels or card stock and pop them on. So simple but your kids will love it! Here’s a peek at each Thanksgiving placemat and tags. I’m a huge fan of polka dots and I think the polka dot boarder adds the perfect pop of color for each placemat. Print enough out for Thanksgiving dinner and dessert. 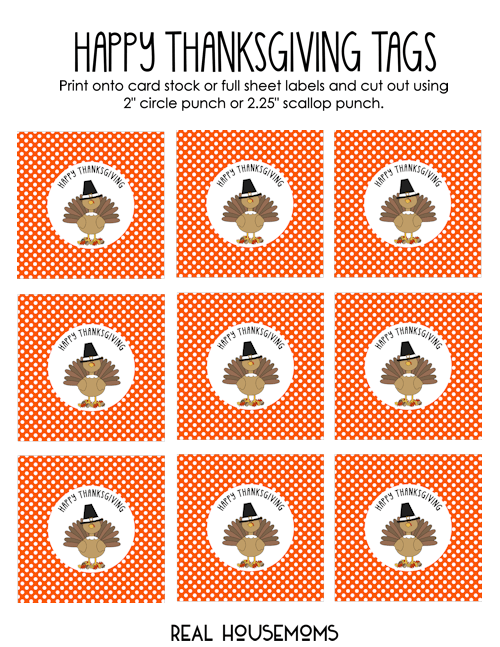 Not only is this a great idea for Thanksgiving Day but it’s also a great idea for those classroom parties. Use them as place mats or as activity sheets. Get more seasonal goodies on our Fall Fun pin board! Follow Real Housemoms’s board Fall Fun on Pinterest.